» What bike lane, where? Albany’s Elm Street on Saturday afternoon. At the risk of beating this drum once too often, what are they thinking when they make the bike lanes impassable in this way? Maybe they figure it’s no big deal if someone gets hit in the traffic lane, because the emergency room is just around the corner. If it was me, I’d check when Republic Services sends its leaf pickup truck down this block of Elm Street — which probably is not Saturday or Sunday — and then I’d pile the leaves in the street that morning or the night before. Hasso: this is but one of the negative impacts associated with “socially correct” narrow street planning standard. Note that the there is a bike rider in the opposite direction. However, the bike path is not adjacent to the curb, it is outside the parking lane. Narrow streets, less hard surface but less parking, and less right-of-way to accommodate two travel lanes for vehicles, two parking lanes and bike lanes away from the curb line. There are other downsides to “skinny” streets also. “Socially correct” street planning? That’s a new one and it begs an explanation. Another problem is a lot of commercial properties use a lawn/landscape service. 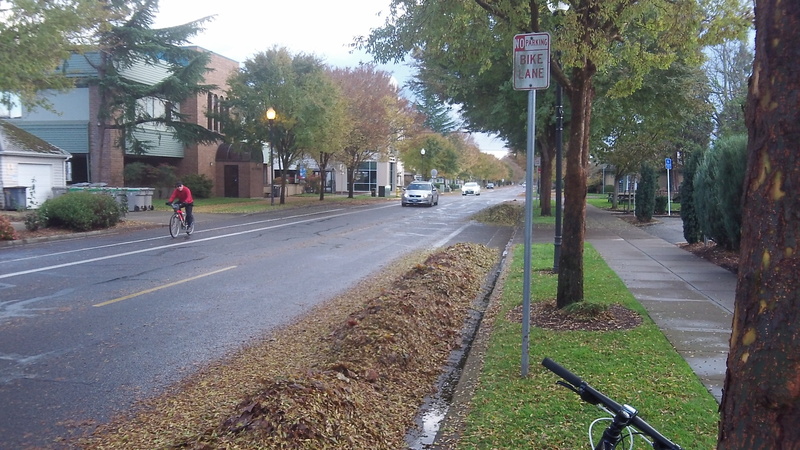 They won’t mow the leaves because then they would have to haul them. They simply blow them into the street weeks ahead of any potential leaf pick up. Things get pretty bad on 14th SE. between the Heritage Mall and Waverly.